How do I turn off chat notifications? Where are downloaded recordings located on my computer? 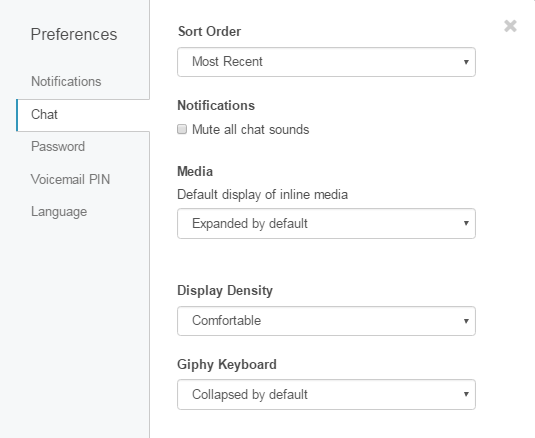 Change notification, chat, password, voicemail PIN, and language settings in the web browser app via Preferences. To access user settings, click your profile picture from the sidebar; then click Preferences. Change the appropriate setting in one of the Preferences tabs. You can test and adjust sound levels for input and output devices. From Preferrences, click Sound. From the device list, select the device you want to adjust. Call Volume: The volume level for the incoming voice on a WebRTC call. Phone Ringer Volume: The volume level for incoming phone call alerts. Chat Notification Volume: The volume level for incoming chat alerts. 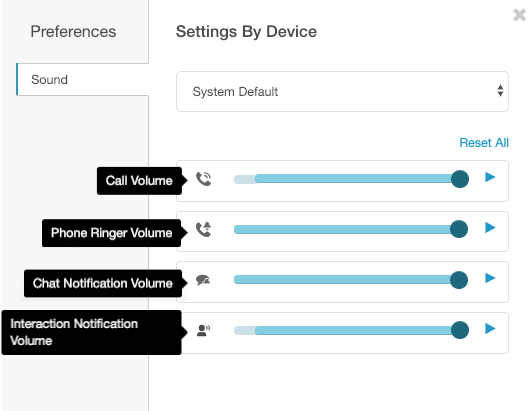 Interaction Notification Volume: The volume level for agents’ incoming interaction alerts. To test the volume levels for each setting, click . Note: You can also access your sound preferences in Device Volumes. PureCloud alerts you to events such as new direct and group chat messages or incoming calls. You can control these notifications. To change your notification settings, from Preferences, click Notifications. Choose to receive notifications on your desktop. To receive all notifications, click Allow Pop-up Notifications. To stop receiving PureCloud notifications, clear Allow Pop-up Notifications. To see how and where notifications display, click Send test notification. Show Pop-up Notifications for Group Chats. Choose whether to receive notifications about new group chat messages. Direct messages and mentions in group chat rooms always create a notification, even if you have hidden all group chat notifications. To receive all notifications, click Show Pop-up Notifications for Group Chats. To hide all notifications except direct messages and mentions, clear Show Pop-up Notifications for Group Chats. Note: To see the Show Pop-up Notifications for Group Chats option, first click Allow Pop-up Notifications. If you do not click Allow Pop-up Notifications, then you do not receive group chat notifications. Internet Explorer does not support notifications. Chrome, Firefox, and Safari support text-only notifications (no emojis in the pop-ups). You can change how chats and the chat roster appear. From Preferences, click the Chat tab. You can also access chat preferences from the chat panel. Choose how chat rooms appear in the chat roster. Most Recent lists chats in each category from newest to oldest activity. A to Z lists chats in each category in alphabetical order. Choose whether new chats produce a sound. To turn off sound notifications for new chat messages, click Mute all chat sounds. To turn on sound notifications for new chat messages, clear Mute all chat sounds. Choose how media, such as images, social media, and videos, display in your chats. To show media open in chats, click Expanded by default. To keep media hidden until you select them, click Collapsed by default. For more information about images and media in chats, see Send media and files in a chat. Choose the amount of spacing between chat room names in the chat roster. For the most spacing, click Comfortable. For medium spacing, click Compact. For the least spacing, click Minimal. When using the /giphy chat command, choose how you want the gif selection to appear. To display the first row of GIFs to choose from, click Collapsed by default. To display the first four rows of GIFs to choose from, click Expanded by default. To keep the display in the state last used, click Remember last state. From Preferences, click the Password tab. The minimum length is eight characters. Passwords must contain at least one number, one special character, one uppercase letter, and one lowercase letter. The maximum length for a password is 400 characters. Note: Your administrator may have established different minimum and maximum requirements for your organization. When you have completed the fields, click Change Password. 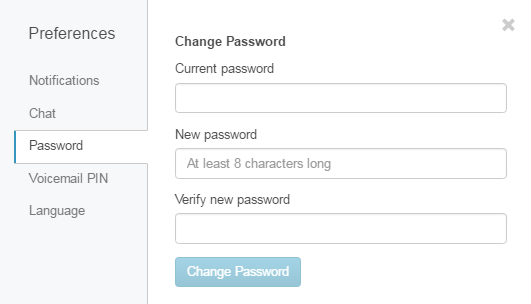 Note: If your new password doesn’t fit your organization’s minimum and maximum requirements, you receive a message with suggested changes to meet the requirements. The next time you log in to PureCloud, use your new password. Use your voicemail PIN to access your voicemail from your phone when you are not logged in. 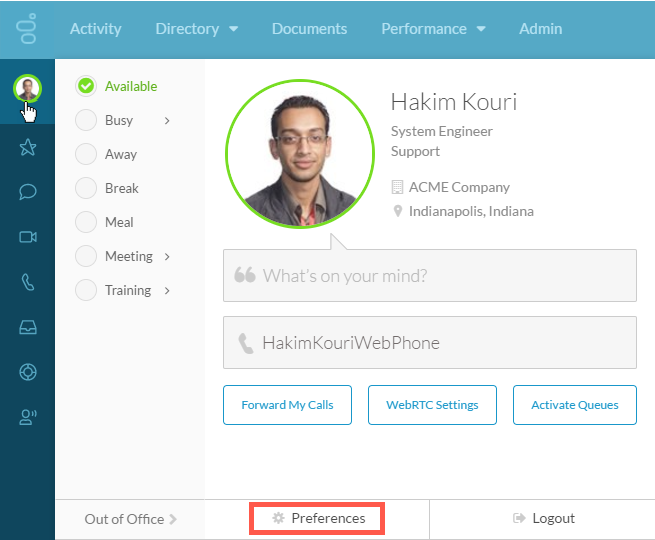 From Preferences, click the Voicemail PIN tab. 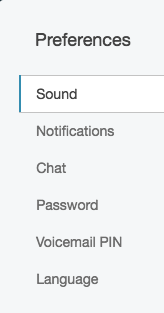 Enter your new PIN in the fields and click Change PIN. Select your preferred language. 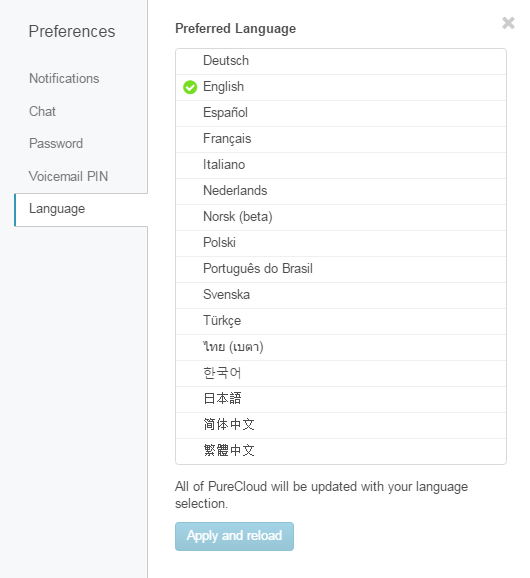 PureCloud updates with your language selection. From Preferences, click the Language tab. Note: In the web browser app, you can manage your location setting in the web browser. PureCloud℠ by Genesys is a cloud collaboration, communications, and customer engagement platform that takes full advantage of the distributed nature of the cloud. PureCloud provides rapid deployment, industry-leading reliability, and unlimited scalability, to connect customers and employees in new, more efficient ways.